In other words, it is FAR from “low usage”, and being located on a busy high street, serving 5 schools, not “poorly located” either. Preston Library is one of the best-performing libraries in Brent. Despite NO real investment for decades. Preston Library campaign achieved more than 6000 signatures on its petition to save the library. Preston Library users DO NOT want their library to close. So how did Brent Council decide Preston Library is too expensive to keep? Well it all comes down to how you use the figures you have in front of you. Comparing libraries in Brent can be done in two ways. The correct way is to adjust the figures to account for differences in size, services offered, hours opened, books issues etc. The incorrect way to to simply compare them like-for-like, ignoring important differences. Smaller libraries offering fewer services and open for fewer days have fewer visitors. Larger, multi-purpose libraries with long opening hours attract more. But, if the small library was extended, offered more and was open for longer, would they have more visitors? Possibly. You have to adjust the calculations to project if this would be the case. Otherwise, how can they know that such drastic measures will really save money and “improve the service”? When making decisions about your money (not theirs), they have responsibility to make sure they are getting value for money, that closing the libraries will really do what it is supposed to do. Apparently, this is all guesswork and hope. Preston Library is not open 7 days a week, is relatively tiny and only offers a basic library service. Yet it attracts almost 100,000 visitors a year (more if the counting was accurate, but it isn’t). 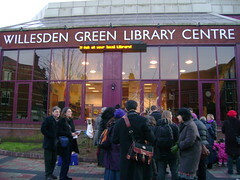 Willesden Green Library (as an example) is several times larger, offers large computer training suites, house the Brent Archives and has large staff offices through the library. It is open 7 days a week. Naturally it attracts more people, because it is open longer, has other services inside and can hold more people. The visitor figures do NOT discount staff walking through the library to get to their staff room and offices. The council decided to compare them directly, without making allowances for these BIG differences which skew the figures. Not surprisingly, they found that Preston attracts fewer visitors than the giant Willesden Green (this is just an example, there are more). But its not a comparison that makes an real sense. Posted on July 11, 2011, in Council Spending. Bookmark the permalink. 1 Comment.